In 2002 I talked with the homeowners association for a multi-floor condo building on St. Pete Beach, the Beau Monde. Like many buildings built in the middle of the century, they had silver aluminum colored single pane windows. Back in the 1950’s there were almost no regulations regarding window strength so these were all in need of replacement. But the condo was leaving that up to the individual owners. 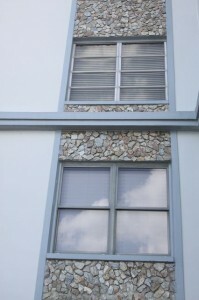 The typical condo requirement of not changing the styles of the windows was in the rules. That makes sense because I’ve seen buildings without that rule look like a hodgepodge with different styles from one home to another. They also stipulated that all the frames must maintain the silver color of aluminum. A potential customer who owned a unit there asked my opinion of the associations rules. “Your association is making a huge mistake requiring everyone to have silver windows,” I told him. My customer wanted to cut their electric bill along with ease of cleaning, sound reduction, and improved appearance. 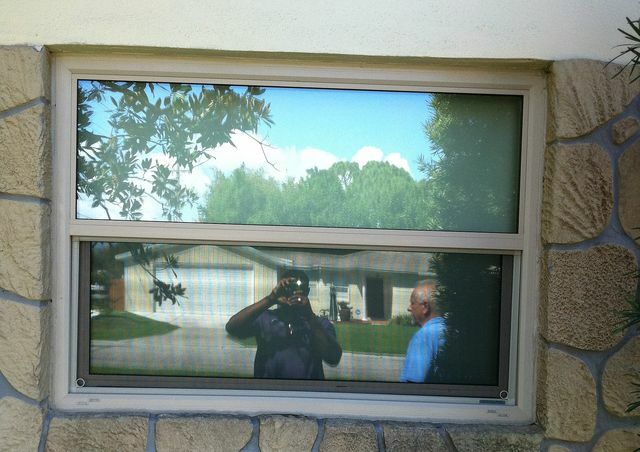 They were adamant about getting vinyl framed replacement windows. They could see that aluminum framed windows were virtually obsolete. No one makes a silver vinyl window- no one. I decided to meet with board members there to let them know the debacle they would have down the road if they continued with the silver window frame requirement. First, aluminum would eventually be outlawed in Florida because of its energy inefficiency. Second, the material of choice would become pure uPVC vinyl framed windows, which is not available in silver. Third, vinyl cannot be easily painted. Most pure vinyl will be either white or tan. Fourth, and critical to my perspective is the fact that if they were to start allowing white, their future would be much more secure. On a bright sunny day if you were to look at a building that had white aluminum windows it would be hard for you to be sure that they were in fact white and not silver natural aluminum color. Both white and silver are very reflective. The visual difference between the two is very slight. Vinyl cannot be painted until it has badly weathered. New vinyl has a sheen and smooth surface to which paint cannot adhere. It can have paint applied through a chemical bonding process. But you know as well as I that most painted items left exposed to the elements will need to be painted again, otherwise they lose their color and fade, or the paint discolors and chips over time. And a chemical bonding of any paint will add cost, even as much as 30% to the cost of new windows. 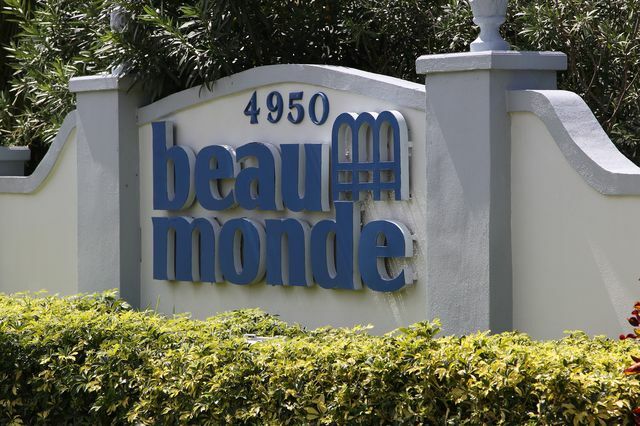 I told the Beau Monde Board that if they were to continue only allowing the silver color they would be setting up all the residents with far greater costs when they did replace their windows and they would also eventually have all kinds of shades of grey throughout the building. Take a close look at the building now. Who was wrong? The reason they wanted the uniformity of the silver color was to preserve the value of the units in the building. I tried to tell them that if they allowed white, there would be little visual difference from the silver. 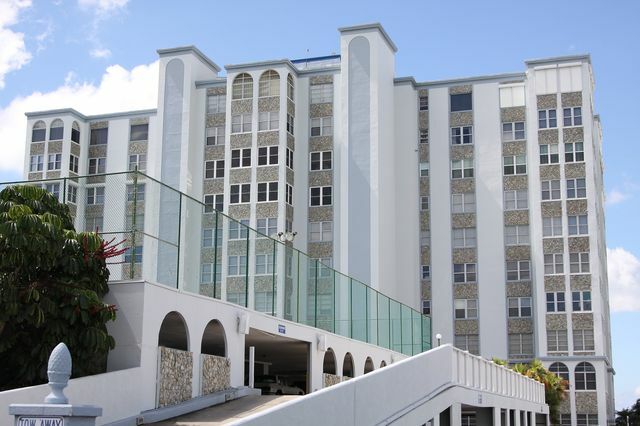 Both would look similar, and eventually all the windows in the building would be white, maintaining uniformity, preserving value, and reducing costs for each resident as they replaced their windows. I had been successful making the case for allowing white windows in condos where aluminum had been the original windows with their natural silver color, but not with the board at Beau Monde. They decided to stay with the silver, and their building looks old and worn because of it. 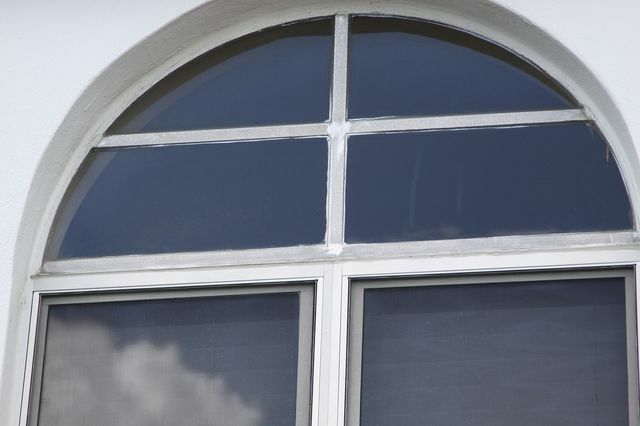 The best vinyl replacement window colors are natural- not painted! Look at the close up of the replacement vinyl window right above. It is chemically bonded silver paint on a white vinyl frame that has weathered. I think you’d agree that white would have been a much wiser choice. I have the same dilemma again. There are complexes that were built in the 1980’s when bronze (almost black) was the “in” color for window frames. If you looked at them now you’d describe their color as tan, because of their fading and weathering. They haven’t faded evenly either. Bronze aluminum is the worst when it comes to energy efficiency in Florida. Would you wear a black shirt if you would be spending the summer day outdoors in the sun? 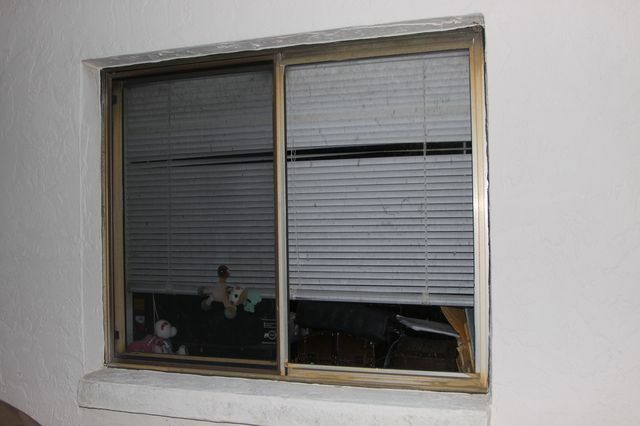 Most of these complexes are mandating that anyone who replaces their windows and patio doors stay with bronze. So residents are required to have their white vinyl windows painted. That paint will fade, just like the bronze aluminum did. It could take as little as 5-10 years for bronze painted vinyl frames to look aged and worn. Even with the chemical bonding, paint will deteriorate faster than the original aluminum did since the aluminum had an electrostatically applied paint. Vinyl cannot be painted electrostatically. If they can see into their future certainly they will allow tan. The window on the right started off as a bronze window and now looks more tan than bronze. A new tan (beige) window will more closely match the majority of the existing windows, and will not fade and weather. 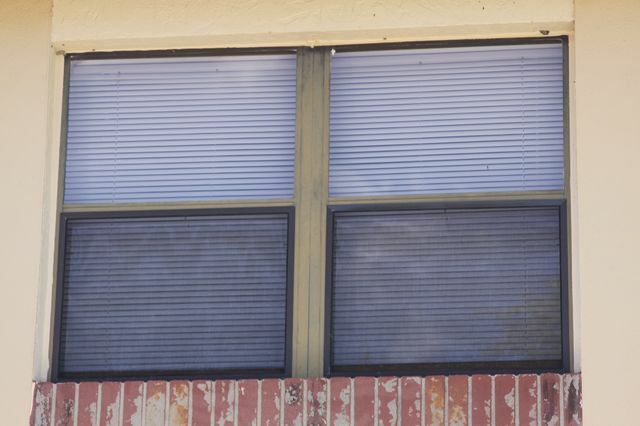 As residents, able to pay less for their windows than if they were required to paint them bronze, replace their faded aluminum windows with tan vinyl, everything will eventually be totally uniform again, with a color that will not fade from sunlight. The beige replacement vinyl window color is a great match for the entire right side of the badly faded bronze window above. It won’t fade to some other color, and remember- costs less than the painted products that eventually will fade. The beige is certainly a better match than putting in freshly painted replacement windows in bronze. I’m sure the people who were on the board at Beau Monde are no longer worrying about those old silver window frames. Many of them were elderly and a decade has passed, but I’m sure the worst decision they made as board members, mandating the silver window frames, will live with the new residents for years to come.